Wipaq provides its clients with world-class technology in security turnstiles such as their model of HTAT FST galvanized body features. This is robust make with operational efficiency and is easy to assemble all by you. The lightweight model is durable and with easy servicing. 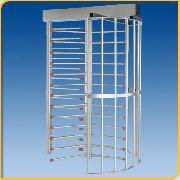 The HTAT-FST Full Height Turnstiles may be ordered in a variety of different configurations. Please call for details. This option includes an unlocking solenoid and electronic interface board with adjustable time control (standard) capable of controlling one or two directions of traffic through an access control device (card reader, RFID, biometric reader) and could be connected to alarm systems. The adjustable time control may be used for automatic relocking of the turnstile if entry is not completed. EXAMPLE 1: (SINGLE UNIT) HTAT-FSTGS21 = A galvanized steel, single passageway turnstile with fail-secure entrance and fail safe exit in the controlled direction(s). EXAMPLE 2: (DOUBLE UNIT) HTAT-FSTGD2121 = A galvanized steel, double passageway turnstile with fail-secure entrances and fail safe exits in the controlled direction(s).